Darlings, in le left corner we have Alexander Wang’s wondrous Rocco Mini Duffel Bag – the very same one seen toted about by Rihanna, Kristin Cavallari, Ashley Tisdale, Nicky Hilton, Mary-Kate Olsen, and Jennifer Carpenter; in the right corner take a gander at the amazing Alexa Studded Calfskin Leather Bag in Black from Bag Inc. While the Alexa is ever so slightly larger in size than the ravishing Rocco; for just $149.00, as opposed to the $875.00 price tag seen upon le ultra-covetable Wang, it is every bit as capable of adding a splash of sophisticated sassiness to one’s handbag collection – at a price that is utterly irresistible for the cheap chica! Thanks to Etui Maison and Bag Inc. for the pictures. Oh, I'd love that. But even the cheaper one would be out of my price range, too. This is so lovely. I love the cheaper version. Hmmmmm... am going to have to (theoretically, of course) splurge on this one! What a funky little bag this is. I'd take the Alexa and use it often! This bag is all over the place/world these days! I love the Wang one! It is my dream to one day own an Alex Wang bag haha... one day! You are scary good at finding cheaper versions of designer products! Great job :) love it! If I had the extra money to spend, I would splurge on the AW one. I would choose the Alexa bag, but I do like bags with longer straps, and faux leather. Good choice of bags, though. If I had the cash, it would 100% be the A.Wang one! But for now, I'll have to go with the cheaper version. i'd have to go with the real deal if i was going to buy this bag... it's gorgeous! 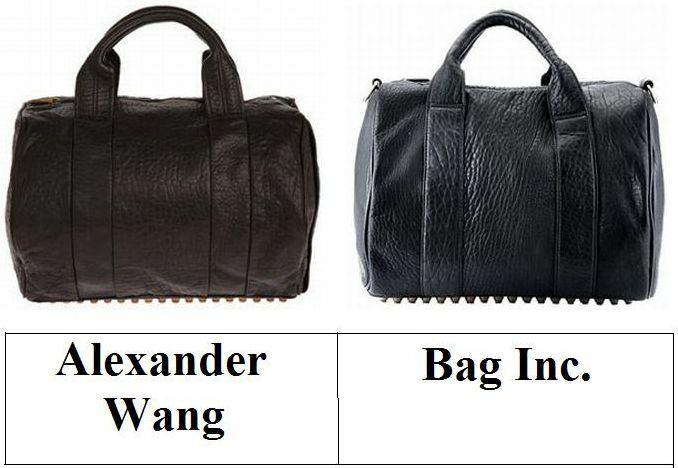 I really want the Alexander Wang bag! Oooh I love those both! love 'em both! and you can't beat the bargain on the Bag Inc. one. I would get the Wang one .... of course but this time I am going with the Bag Inc. one. I really like it, and i woudl definitely go the thrifty route. I wish I could bring this on my next vacation. I'd so love one of these!! This is such a great bag to have. So glad there's a cheaper one. I think it's such a well known design - I'd feel funny about the less expensive version. Pretty cheeky knocking off such a well-known bag. It is a good copy though! Im so glad to have come across your blog again after i had a look at my old blog from last year! I would pick the alexander Wang one simply due to the soft brown leather look! Gorgeous bag! It'll be able to fit everything and go with every outfit. I love the Alexander Wang one. I am amazed by your ability to find these. though here, for sure I like the Alex Wang version. Am a sucker for great leather. An exact replica! Though I'm sure the devil is in the details. I bet the Wang bag's leather is incredibly soft and luxurious! okay whoa. that is a crazy knock off!! i'm going wang on this one...i'm surprised some of these brands don't get in trouble for the spot on copy. i kinda like it in brown better, but the less expensive version is pretty much identical! Don't forget to enter my fringe shimmy necklace giveaway! To be honest, I never really cared for Alexander Wang. But, there is one pair of shoes he designed that I'm dying to get my hands on. I just bought this bag and it IS amazing!